Khao phat (Pak) jay were among the first words I could form in Thai. I could probably say it with more confidence than even Sawadika, hello, before learning the language. Khao phat jay, vegan fried rice. Surely it was the only variety of food I ate until I realized how to pronounce words off of menus and add jay, vegan, to my request. There is no word for vegetarian in Thai. Not one I ever learned anyway. Most often jay meals came with fried egg or fish sauce, unless requested otherwise, beforehand. During my five month stay, I visited all regions of Thailand and ate some of the greatest foods. Still today I daydream about a little restaurant/hotel/scuba dive that served the most savory vegetarian “no-name burgers.” Vegetables and soy or plant protein battered and fried together in the form of a burger so large that I was forced to take large bites or risk losing the burger to my lap. It was served with creamy sauce and lettuce, squeezed between two toasted buns. Considering it was fried and so large, it’s amazing that I had this burger twice (on two different occasions) and managed to go swimming immediately without pain. Aside from the no-name, the best place for fresh vegetarian, vegan and all around cleansing foods is in Chang-Mai. It’s in the northern region, not where I lived, but where I wish I could live even today. Smoothies are made with wheat grass grown in restaurant windows and feature any fruit a heart desires. Oh my goodness… I could go on forever. There is nothing unhealthy or distasteful about Chang-Mai meals. One place, as close to my heart as my dear Thai language teacher, was a family/friend-operated restaurant that served comforting, homemade meals. My peers and I dubbed the all female-run joint “Across the Street,” because it was located just across from our hotel/dorm. Across the Street served my favorite comfort food, the first meal I could appropriately request, khao phat jay. Remaking this meal at home brought back so many joyful memories of sharing meals with friends after school. Laughing with the restaurant/homeowner’s toddler son as he performed tricks and spoke to us in fluent Thai to garner our attention. The pigs that ran along the unfenced side yard and the small cat that liked to sleep in the lap of any willing customer. I love the ability food has to transform me back in time, even for just a short minute. I hope you find pleasure in sharing this with your loved ones. What have you been cooking up these days? 1: Heat oil in a wok or very large sauté pan (if the pan is too small, use half the oil and cook half the amount first). When the oil is hot, add garlic. Stir and fry just until fragrant. 2: Add the optional protein. *Cook eggs just until they set, or scrabbled tofu just until it begins to brown. If using cooked beans, add them and continue with directions. 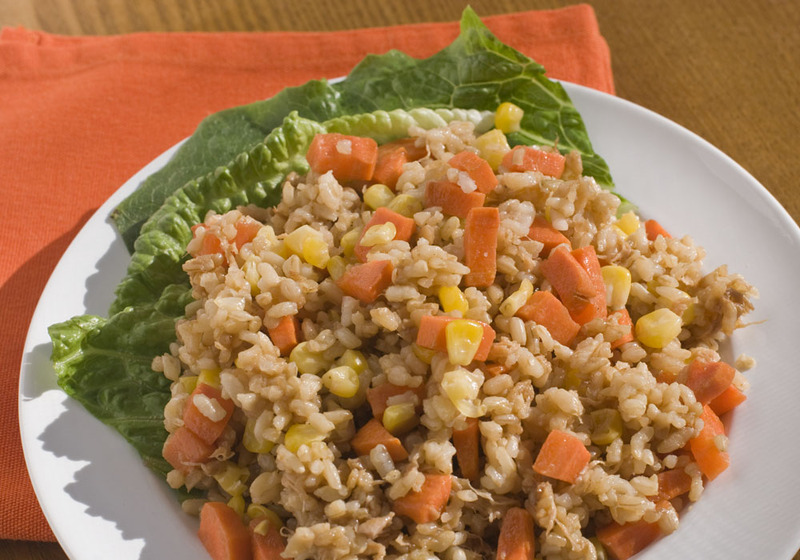 3: Add carrots, rice and corn. Stir until rice dries to your liking. Season with soy sauce and pepper. Serve warm. My experience is that Khao Phat Jay is either with or without eggs to suit vegans or vegetarians and can include any vegetables available. Across the Street rarely served the same variety twice in one week, so I never knew what vegetables to expect.